How To Stay Sane….. When Organising A Hen Party! 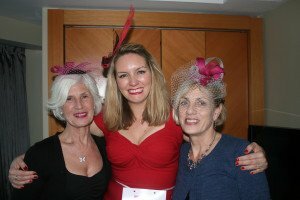 I have liaised with hundreds of hen party organisers over the 6 years I have been running Glam Hatters’ Tea Parties and there are 5 common factors with almost all of my email conversations with the hen party organisers. 1. Numbers attending the hen party will increase/decrease dramatically! 2. Every one has an opinion of how the hen party should run. 3. Unlike your usual “party girls” party, at a hen party there will be a very varied age range. 4. There will always, always be a few hens in the party who are on a “bit of a budget”. 5. 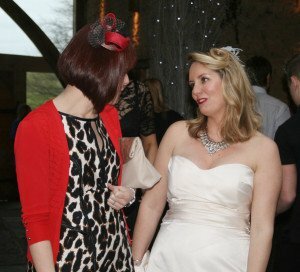 Hen attendees will not always get back to your emails/texts/frantic voice mails straight away. 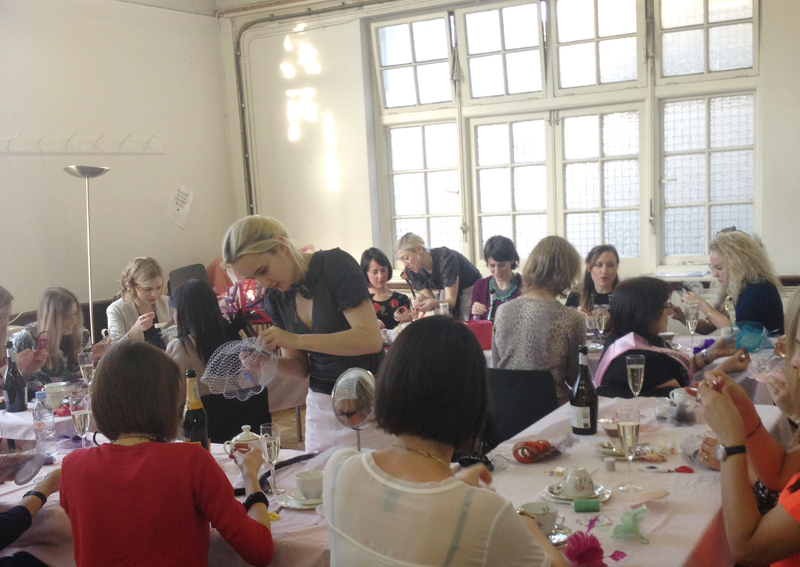 Glam Hatter Girls Teaching at our Exmouth Market, London venue. 1. Check with the hen party provider what their minimum and maximum number is. That way as soon as you hit the minimum number you can put down a deposit to save the date you would like. 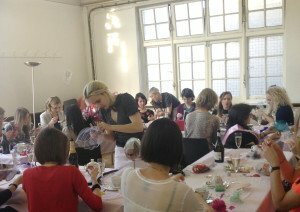 At Glam Hatters we have a minimum number of 8/10 hens (depending on the package) within London, the minimum number may be higher for parties outside London but always check with us as if it’s easy to get to we may be able to run a workshop for a smaller party. If the workshop provider has good customer service (like us!) they will value your business and always do their best to run the party for you no matter what the number. It’s also a good idea to check on maximum numbers from the outset. Hen parties have a tendency to snowball. We’ve had parties book in for 14 and end up with 28! For us it’s not a problem as we have lots of brilliant teachers to ensure the parties go smoothly. Check with the activity provider if there is a possibility that this may happen with your party. 2. Email all the hens with details of how the hen party is going to run. You are organising the day for the bride-to-be and as her bestie you will have the clearest idea of what she likes doing the most. If you are unsure check in with two of her closest friends. The bride-to-be’s long distant cousin who she sees every four years or so may have an opinion of how the day should run, but you’ll be getting into a whole lot of hot water if you ask everyone for their favourite hen party ideas. As they say, “You can’t please all the people all the time”! Choose your activity with the whole party in mind but the bride’s interests at the heart of it. 3.Arrange separate, age appropriate hen party activities. At our fascinator making workshops we usually have the whole shebang – the party girls, the Mums, the Nanas, the pregnant friend, the 16 year old cousin and on quite a few occasions the brand new Mum breastfeeding while making a fascinator! At Glam Hatters everyone is seated around a table laid out with candy coloured table cloths and gets a chance to bond over colour choices and afternoon tea. After the workshop the hens tend to head off for dinner and drinks, sometimes the Mums go with them but it’s usual at this point that the Nans and pregnant friends head back home. Then after dinner and drinks the numbers drop again and the party girls head off for late night dancing. the trick is to have at least one activity that everyone can join in with and still be in their comfort zone whilst having fun. 4. Split each hen party activity up when emailing the hens and put a cost next to each one. Let everyone know that each activity is optional. That way the hens can choose which part of the day they want to attend and how much they want to spend. This will also stop any hens who are on a budget from being stressed about finances. Also if you have a budget and it looks like the activity is out of your price range ASK FOR A DEAL. Most hen party suppliers will try and help. 5. Prep for your hen party early on. As the organiser you have a lot of responsibility and it’s hard when hens don’t get back to you straight away with answers. Don’t take it personally, 90% of hen party organisers I have talked to have the same problem. There is no magic formula to speeding up getting people to reply to emails. The best way around getting stressed by this particular problem is prep. You may have 6 months until the hen party but the earlier you decide on the activities, the earlier you can get the holding emails out for your date. At Glam Hatters we often pencil parties in and contact them if another party asks for the same date. You can then email all the hens and know you have plenty of time to send reminders out. Another plus on starting early is that you can give all the hens your bank account details and they can pay for the activities they want to take part in straight into your account. Big love to all you hen party organisers, I’m here when you need me!